There are so many ways to give of your resources for the good work of The Salvation Army. Because our community services never cease, neither does our need for financial support. Whether you are moved to make a one-time donation, or you wish to make an ongoing impact through a long-term giving plan, we are grateful. Every dollar counts as we strive to demonstrate the love of Jesus Christ…and do the most good. Please remember that checks and money orders can be made payable to “The Salvation Army”. If you would like to donate now by credit card, click here. Many companies sponsor employee-giving programs that match personal contributions to The Salvation Army by individuals. Please check with your employer to see if such a program is available, as you could potentially double the impact of your gift! Most employers require you to send a Matching Gift form with your donation and for us to complete this form. Don’t miss this opportunity to double and possibly triple your gift! Contact Kristi Stratton at (904) 301-4839 for any questions. Gifts can be made in memory and/or in honor of individuals at special times throughout the year, such as a birthday or anniversary. During the holidays, families will often make a donation to The Salvation Army in lieu of giving presents. To make a gift in this way, simply send in your donation with a note referencing the person of whom the gift is in honor/memory. A local Salvation Army representative will then mail a card to the person you’ve designated, stating that a donation to The Salvation Army was made on his or her behalf, Kristi Stratton at (904) 301-4839 to discuss your Memorial or Honorary Gift. Your used furniture, clothing, and other household items will enable you to make a tax-deductible contribution. 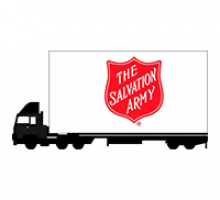 Donated goods are sold in Salvation Army Family Stores to help support your community. Find a Family Store near you to drop off goods here. Schedule a pickup by clicking here or call 1-800-SA-TRUCK. Used vehicles can help put those in need back on the road to recovery. By donating your gently used items, car, truck, motorcycle, RV or boat on a trailer, you can help us serve clients who are succeeding with God’s help. Vehicles donated to the Salvation Army of NE Florida are processed by our auction partner to raise funds for our many programs. To donate a vehicle, contact us by phone at (904) 641-2122 or call 1-800-95-TRUCK. To organize or host a drive for canned foods, toiletries, blessing bags, new clothing items, school supplies and forgotten angels, please contact our Special Events Manager/Kettle Coordinator, Kenya Bell, at 904-301-4852. What is the William Booth Society? The William Booth Society, The Salvation Army’s most prestigious donor organization, is named for the founder of The Salvation Army who began helping the destitute in London in 1865. The Salvation Army of Northeast Florida has established The William Booth Society (WBS) to recognize and honor donors who make an annual gift of $5,000 or more to support Army programs and services. Who qualifies as a member of the William Booth Society? The William Booth Society recognizes organizations (churches, corporations, and civic organizations), foundations, and individuals who give $5,000 or more to The Salvation Army of Northeast Florida on an annual basis from January 1 through December 31. All donors are recognized as William Booth Society supporters and may remain anonymous, if they wish. Gifts of appreciated assets, such as stock or mutual funds, are a simple, effective and tax-wise way to support the work of The Salvation Army. To find out more about this gift-giving opportunity, please contact Heather Corey at 904-301-4855 before giving your order to your broker. This way, The Salvation Army is able to track your gift and ensure that it is used as designated. Support programs and services consistent with your ideals and maintain lifetime income with no management worries or fear about organization stability. Planned giving offers protection for your loved ones through income after your death, and makes giving larger gifts more possible than by any other means. Other benefits include income tax savings through present charitable deductions, lower estate tax for your spouse and other heirs, preferential treatment of capital gains tax that you would incur if you had sold your property, and control of the distribution of your estate at your death. For more information about making a gift to The Salvation Army of Northeast Florida, contact Denise McMeekin at Toll Free: (800) 758-2769.